We live in an increasingly multi-faith world. People of different faith traditions are no longer foreigners living in different countries. They are often our neighbors, co-workers, or even members of our extended family. While we may still think of our nation as predominantly Christian or of “Judeo-Christian” heritage, today the largest growing groups in many communities are from other religious traditions. And when we take a closer look at the history of this continent, we realize there were large communities with vibrant faith traditions of their own before the first settlers arrived. Some may see these different faith traditions as a threat to their way of life, where others might see them as a blessing. Roman Catholic theologian Hans Küng writes in his book on world religions, “There will be no peace among the peoples of the world without peace among the world religions.” (Hans Küng, Christianity and World Religions,& Orbis: New York, 1993, p. 443). Disciples’ Council on Christian Unity concluded in their document on “Disciples of Christ and Interreligious Engagement” that, [W]e unequivocally affirm that to be faithful to God’s call in today’s religiously pluralistic world summons Disciples intentionally and whole-heartedly to engage in interfaith relations and work. This study is not a study of world religions; rather, our goal is to understand why we, in the tradition we call the Christian Church (Disciples of Christ), should engage in interfaith relations, how those relations intersect with our Christian witness, and what gifts we as Disciples have to bring to such relationships. 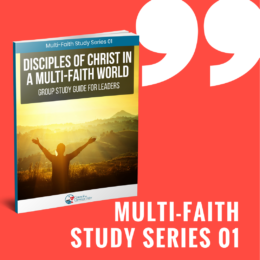 Click on the button below to learn more about the Multi-Faith Study Series and to download your free copy now!